What does this Hardwork and Success Quote teaches us? 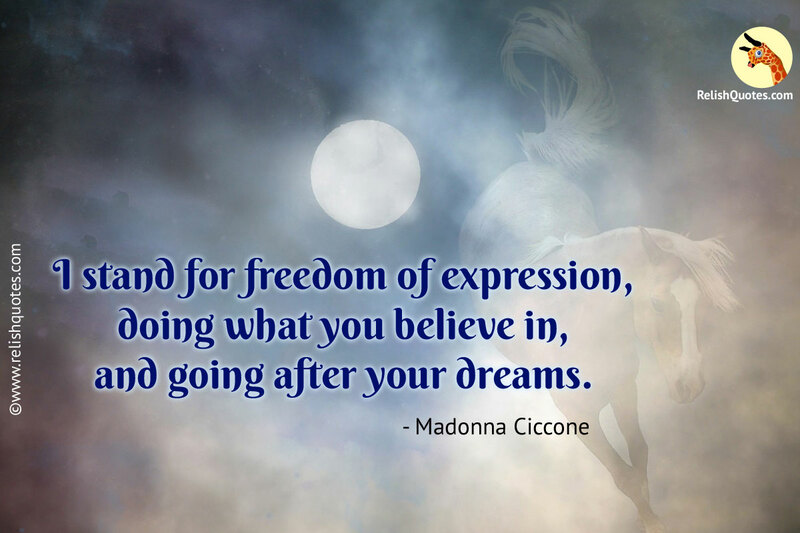 It is the spark of such Success Quote like this one by Madonna Ciccone, which ignites the fire within us to speak our mind, fearlessly. It is absolutely necessary to practice the freedom of expression, for peaceful sustenance in life. You should never give a second thought about or before voicing your opinion. If you believe in something you should let the world know about it. Speak your heart out without any inhibitions. Stick by what your heart tells you. Utilize the power of the inner voice and fight the world, using your words like swords. It should always be your thought, your voice, your beliefs and your judgements according to which, you live your life. Rebel and go against those who bully you. Abstain from the company of men, who do not support you for realizing your dream. Never surrender in front of people who detest you for working towards your dream. If you are right, you never know that your freedom of expression may motivate and awaken the conscience of a thousand other men, and you might become responsible for revolutionizing an era. Burn the midnight oil, work hear and remain undeterred in order to establish your being. Aim high and work day and night to achieve it. Believe in yourself, if you wish for others to believe in you. It is the freedom of expression that liberates you from the suffocation of holding on to your thoughts. Once you give a voice to your thoughts, you find yourself free and begin to breathe easy. There is no point if you hold on to what you think. There is a fair chance of you, to achieve and attain height in every spectrum of life, once you realize the value of freedom of expression. Come what may, voice your thoughts, trust yourself, stick by your set of beliefs and nothing can stop you from turning your dream into reality.